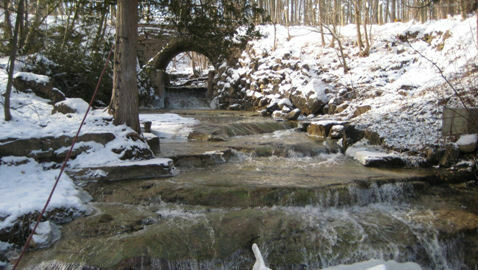 If you walk the Bruce Trail near Georgetown and go to trail 13, you will be walking on the land of the Fallbrook Farm, known until 1943 as the McKay farm, or Uncle Sandy’s place. It is an idyllic setting, renowned for its natural beauty and the fact that the an original pioneer log cabin stills stands, in mint condition, hidden discretely by wooden siding. 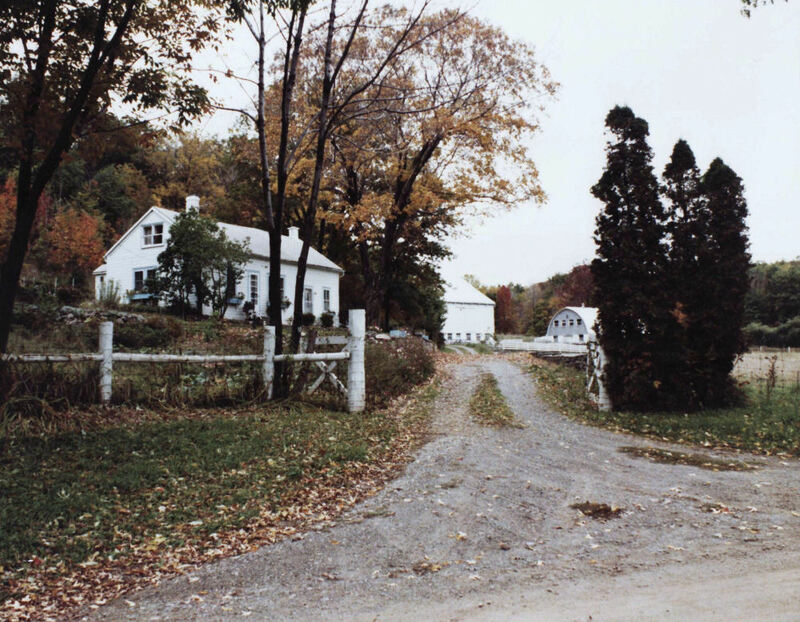 Until 1999 it looked exactly like you see in this picture, but, tragically, the original barn was torn down. Since 2001 the home has been abandoned after 150 years of sheltering the farm families who cleared and developed that inhospitable land. First settled in the 1850’s, the Silver Creek area, bordering on the Niagara Escarpment was not well suited to profitable farming. The toil and struggles of the Scottish immigrants, many crofters expelled from their homeland, who opened this region has never been told or even recognised as historically significant. The battle for Fallbrook is not only a quest to resurrect the homestead as a living teaching museum but also as a memorial to these farm families, of whom we are the descendants. The heritage site consists of the homestead, an icehouse, classical highlander stone walls and an arch bridge over Silver Creek, together with the Providence cemetery, on William McKay’s land, where Donald, his wife and son William are buried. The original tract of land was purchased from the Canada Land Company in …... The family of William McClure used it as a woodlot, but never settled there, having established their family farm two side roads away. In 18? ?, it was purchased by the John McDonald. We suspect it is he who chose the location and built the original cabin. Fresh water was always a problem in the SilverCreek area, so the proximity of the farm to SilverCreek would have been a major factor. There was a huge stand of ancient pine trees just behind the front field. The wood for the home and the original barn were taken from that pine forest. Donald McKay, my great grand-father, together with his wife Jessie, emigrated from Glasgow, Scotland in directly to Toronto, in 1869. After a short stint as a taxi driver , he bought the tract of land at Silver Creek and moved his wife and newborn son, my grandfather David, into the log cabin and began the arduous task of creating a working farm. The McKay’s stayed for seventy years, until my great uncle Sandy, in 1943, sold the farm for $10000 to the Vaughn’s of the T.E. Eaton Company. The last farm family to work the farm were the Keirs, who emigrated from the region of Aberdeen, Scotland. It is a coalition of the McKay-Keirs, inspired by their matriarchs, Rachel Swann McKay and Cathie Kier, and supported by a vigorous team of history buffs and justice seekers who are leading the battle for Fallbrook. It is far from won but progress has been made. To destroy this heritage jewel would be a tragedy. Little information is available on the day to day life of the early settlers of SilverCreek. We can only imagine what it was like to arrive in those huge forests, and seek to carve out a life and actually survive. Sheltering in a form of lean-to, no roads, no stores near by, threatened by wild animals, devoured by bugs in the summer and striving to stay warm in the bitterly cold winters, we can only imagine from the cozy comfort of our modern homes what it was like. With our resident historians and genealogists, Joan Kadoke, Graham Bruce (Durness, Scotland) and Hilary Dawson, we are researching this story and tracing the crofter roots of these early pioneers. But we do have the witness of my Aunt Rachel, who spent many summers on the farm with my deceased father between 1925 and 1943. As memories come back and we meet other elders of SilverCreek, we will add to this history. The Scottish Studies Department of the University of Guelph is helping in this endeavour.. The surviving elders of SilverCreek are all women over 80, keen and bright as the waters of SilverCreek. Aunt Rachel continues to be a champion bridge player. Rachel had lots of young visitors from neighbouring farms who came to visit. Of course there was no electricity and all cooking and heating of water was done on the woodstove. There was no summer kitchen, so in summer the house sweltered. The original home consisted of a large kitchen/living room and two small bedrooms in which 9 persons lived. Donald later added an upstairs dormer and a cold cellar. We will show pictures in an upcoming article. Most of the long day was spent clearing the forest or taking rocks off the fields. All of this was very labour intensive. The rocks were moved by brute strength, using a stone boat. This was a wooden sled, without wheels pulled by a single horse. The stones were picked, loaded onto the boat and drawn to the wall being built at the time. 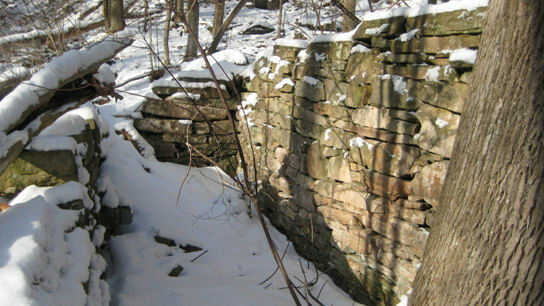 One such wall is actually part of what is commonly called Robbie’s Ice House, where ice, cut in spring was stored for use in the summer . On August 10, Rachel’s birthday, the neighbouring children would come for the day than the adults would come and socialize in the evening. But the McKay’s were dour, strict Presbyterians who worked from dawn to dusk and socialising was rare. Uncle Sandy did play the fiddle in his later years and was known to go to the Legion and have a few nips. `` He would never dare to drink at home, or even in the barn. Lord knows why he did not drive off the bridge into the Creek. There were no guard rails. Must have been only a nip or two.`` In following articles, we will tell you more of these wonderful stories from the Silver Creek elders. The campaign to save The Fallbrook Heritage site from demolition is a story in itself. As youngsters growing up in Guelph, we were brought over to visit Uncle Sandy and Aunt Kate (Sandy’s wife, Eggie Cole had died much earlier) twice a year and to go to our ancestors’ burial site at Providence cemetery on William’s farm. When we moved from Guelph, my younger brother Robert kept returning but I was far away in Quebec or working in the far North as a nurse and never returned for over 50 years. All Donald’s descendants had drifted away from Fallbrook, dispersed to all corners of the country. More about that in a later article..
For the first time, I visited The Scottish Highlands in September of 2007. I had no intention of tracing family, more interested in living history than chasing ghosts. I got involved as a volunteer helping with the John Lennon festival in Durness, the most isolated village in northwest Scotland. I became assistant to the community director of the festival, Graham Bruce, also chairperson of the MacKay Community Trust and his wife Jill, both school directors. Through pure chance, we became to understand that, as relatives of the Keir family, they had often visited on a heritage farm in Georgetown. We finally confirmed that the Keir farm is the original McKay homestead. The day after my return from Scotland, I revisited the ancestral farm with Cathie Keir, the last farm woman of Fallbrook. Since, our luck continues as we vigorously pursue our campaign to save Fallbrook. Many things fall into place. Thus the serendipity of Durness! 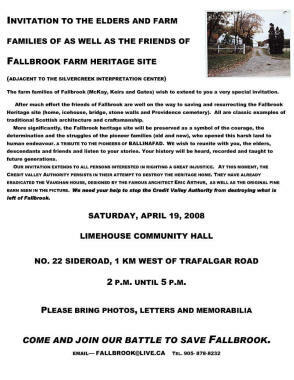 The battle for Fallbrook is a campaign to resurrect this precious heritage site as a memorial to the Celtic farm families, old and new of SilverCreek. Without their toil and struggles, the Halton Hills region would not know the incredible prosperity that it now experiences. It is essential that young people today be taught this vital history. "Above all. The crofters have the feeling that the croft, its land, its houses are their own. They have gathered its stones and reared its buildings and occupied it as their own all their days. They have received it from their ancestors who won it from the wilderness and they cherish the hope that they will transmit it to generations to come. Whatever be the legal theory, they feel it to be their own..."
Visit the North Halton Celtic Historical Society forum here! You can read the Impact Statement here! Update 4 - How do you decide if a site is worth preserving? 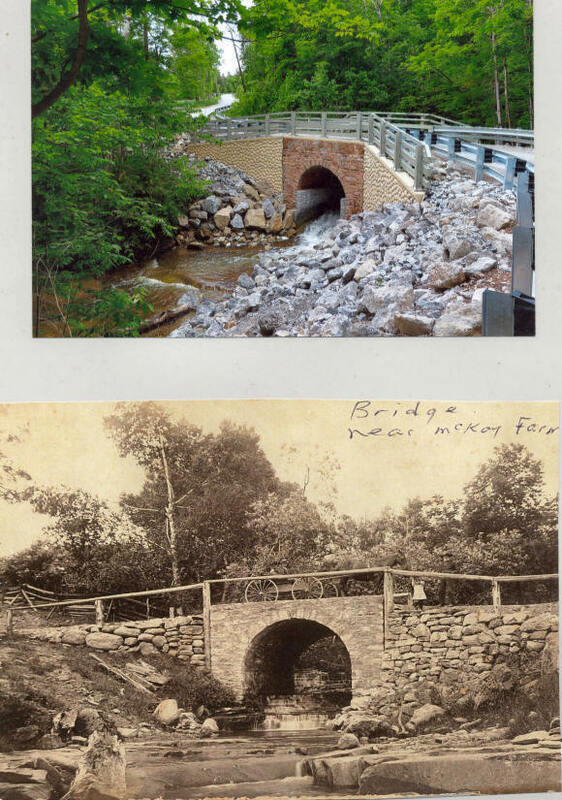 Update 17 - Credit Valley Conservation, Ontario Heritage Trust & letters, etc. Update 19 - Ballinafad Community Roots, etc. Update 21 - The Icing on the Fallbrook Heritage Cake, August 21, 2009, The Culvart. Update 26 - I attended the Fall Colloquium at the University of Guelph where Sandy MacKay was giving a talk about the Fallbrook project. You can see pictures and a video of his talk at this link. Update 27 - Update for 27th October 2009. Update 31 - Council designates the entire Fallbrook Farm. Update 34 - Scottish Studies Foundation help fund Business Plan. Update 57 - The Life and Times of James Palmer Kirkwood plus additional information on the Kirkwood family sent in by Marion Kirkwood. Update 60 - Alma Sinclair (McEnery), who spent all her life in the Fad, has passed away.